Dara has been attending the church for the past two months. He initially began coming because of the good testimony of one of our men, Taiwan. I know that some of you have been praying for his salvation. Over the past several weeks he has been counting the cost of what it would mean to become a believer in Jesus Christ. Bro. Keo, in particular, has spent quite a bit of time teaching him and encouraging him to get saved. We are happy to say that yesterday God answered your prayers as he accepted Christ as his personal Saviour. Please pray for Dara as he begins to grow in the Lord. SreySa is 13 years old. She has been attending our Children’s ministry on Saturdays for quite awhile. Recently she has begun attending Sunday services as well. Yesterday she accepted Christ as her personal Saviour. One of the things that God has used to help her see her need to be saved is the good testimony of her cousin, SreyNeang. SreyNeang has been very faithful and her family has started to notice. Please pray for SreySa to be faithful to the Lord. She is the only believer in her family. This evening after the service she asked me if she could follow the Lord in believer’s baptism. After our Sunday morning service we have a group from the Phnom Penh church who commutes to the village to hold Sunday services there. They return to Phnom Penh in time to take part in our Sunday evening services. 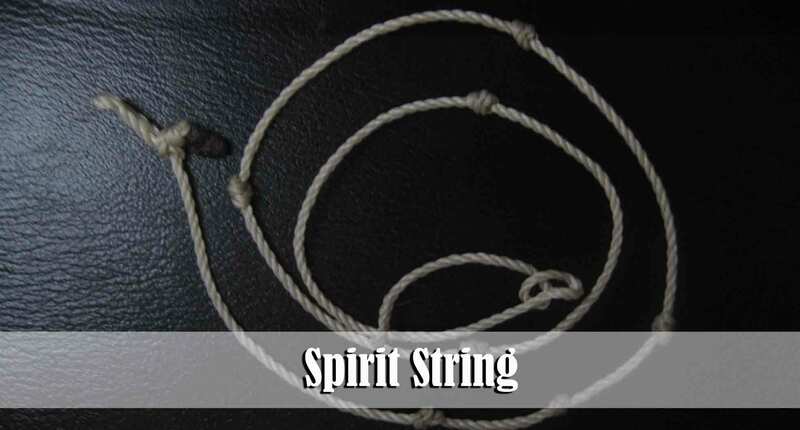 This evening one of the workers very joyfully handed me this spirit string. It is from the waist of a young lady who accepted Christ during the service today in the Cham village. Here in Cambodia most of the Buddhists and the Muslims look to the witch doctors for protection and appeasement of the evil spirits. They very often wear strings around their wrists and waists. These strings have had spells placed on them by the witchdoctors. Acts 26:18 says, “To open their eyes, and to turn them from darkness to light, and from the power of Satan unto God, that they may receive forgiveness of sins, and inheritance among them which are sanctified by faith that is in me.” We are thankful to report that two folks accepted Christ in the village this afternoon. Indeed the devil lost jurisdiction today in the lives of these new believers. Please continue to pray that the Cham believers will be faithful to the Lord. 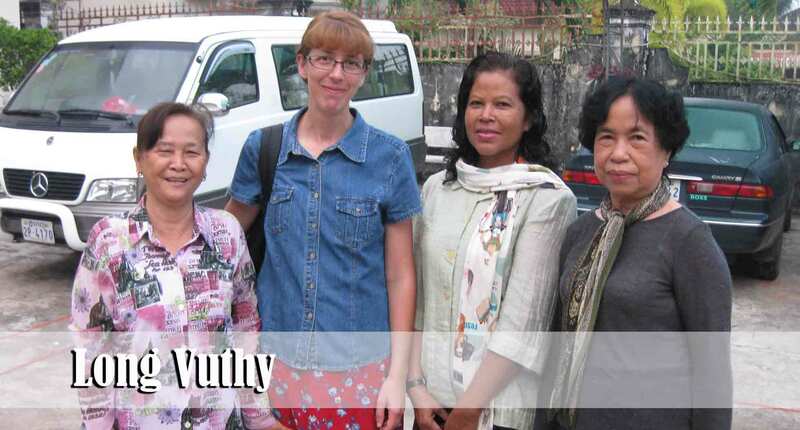 Our workers have been witnessing to Yim for the past 6-7 months. 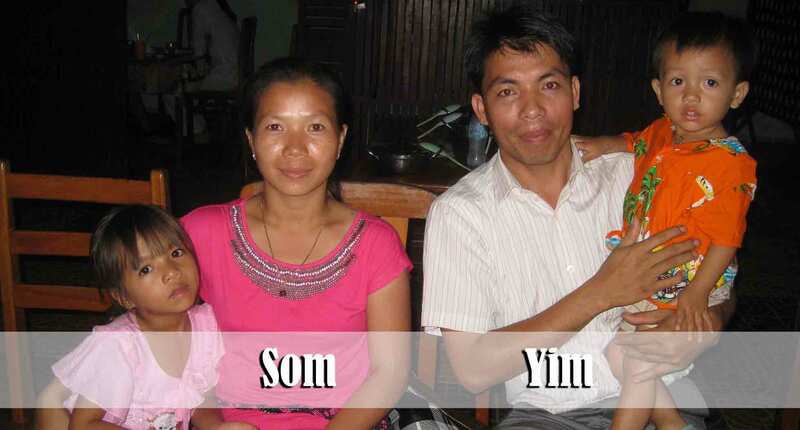 His wife, Som, accepted Christ several months ago and has been a faithful testimony to him in the home. We are thankful to report that Yim trusted Christ as his personal Saviour last Sunday after the morning service. He is truly hungry to know God’s Word. Please pray that we will have wisdom as we help to disciple this young family. I was able to spend several hours with him this past week. As we spoke he shared with me how God has already begun changing his life. He is a mechanic and he said that before he had an awareness of God he would often cheat his clients. (This tends to be the norm here in Cambodia.) He told me that he now does everything he can to be honest with those who come to his shop. He told me that one reason why he wants to grow as a Christian is so that he can effectively witness to his clients while he is repairing their vehicles. Chenda made a profession of faith 10 months ago but shortly after that he disappeared. His job has taken him to Thailand as well as to remote provinces here in Cambodia. Last week he showed up at our home and said that he is now married and wanted to introduce his wife to us. He expressed interest in bringing his wife and brother-in-law to church. Today he brought his brother-in-law, Sambo, to the morning service. Please pray that we will have an open door to influence Chenda, his wife Channy, and Sambo. Every Sunday after the morning service I take 8-10 of the children out to distribute tracts in the community. Though they are not very polished, they have a heart to share the Gospel. 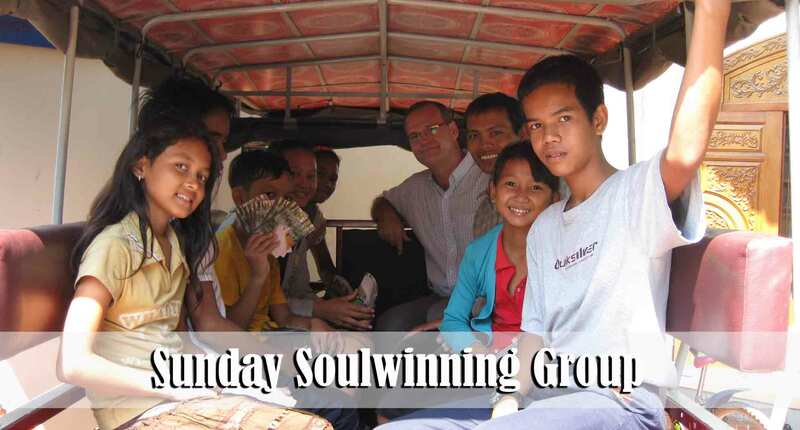 It is a blessing to hear them singing in the back of the Tuk Tuk as I am driving to the neighborhood where we are presently soul-winning. Today they were singing the chorus “Humble Yourself in the Sight of the Lord” as well as a very old hymn that they learned here at the church, “O Zion Haste.” We hope and pray that these children and many more will continue to stand for the Lord. This past week we had the opportunity to visit Kompong Soum with 32 of our folks. 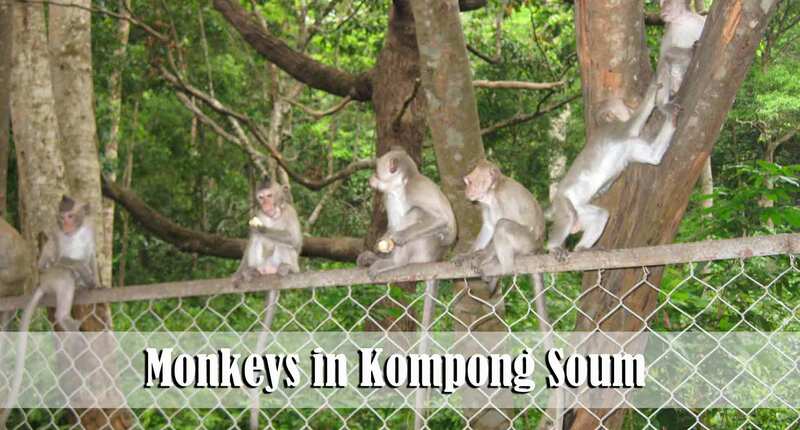 Kompong Soum is a city located right on the Gulf of Thailand. It was a blessing to be able to spend about 40 hours with these folks and to fellowship around the things of the Lord. 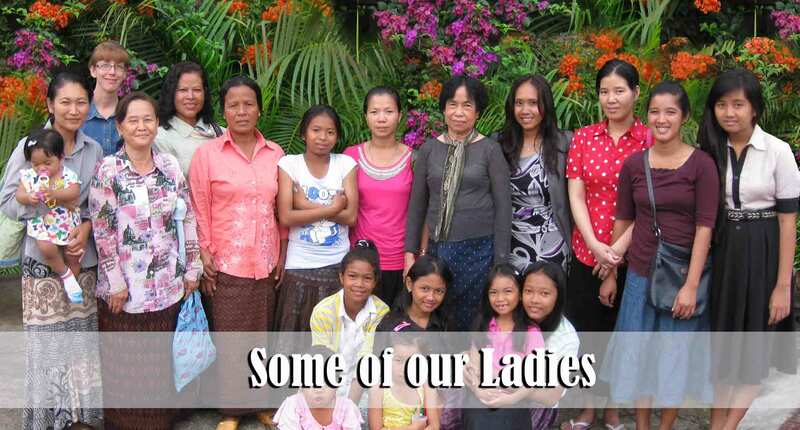 This is a photo of the ladies who went on the trip. We did not get a photo of the men. Ephesians 6:12 “For we wrestle not against flesh and blood, but against principalities, against powers, against the rulers of the darkness of this world, against spiritual wickedness in high places.” There is a shrine along the road that goes to Kompong Soum where nearly every traveler stops and offers sacrifices to the local “deity” named Yeay Mao. 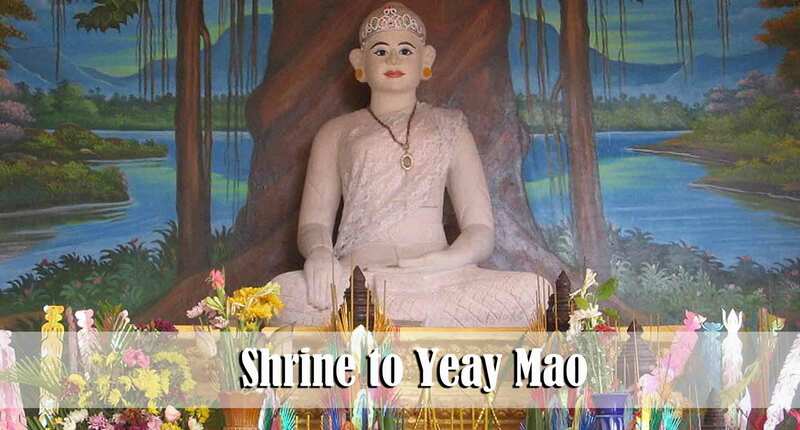 Yeay Mao is believed to be a powerful spirit who controls a certain part of the province. It is believed that if one does not stop to sacrifice to this spirit then very bad things will happen to them. We rented two vehicles and drivers to travel to Kompong Soum. One of the drivers was a Christian and one was not. The driver who is not a Christian purchased a large bunch of bananas to offer as a sacrifice. When we got close to the shrine the driver insisted on stopping and sacrificing; however, our believers would not allow it. That was the first time he had ever passed the shrine without offering a sacrifice to the devil. He was not very happy with us I don’t think. Long Vuthy was saved here at the church this past year. Prior to knowing the Lord she also was a slave to the powers of darkness. She came to speak with me right after our Saturday morning Faithfulness Rally (soul-winners meeting). She shared with me that she had endured horrifying nightmares Friday night after driving back to Phnom Penh. In her nightmare Yeay Mao appeared to her and made certain threats. She shared how the spirit tried to grab her by the arm and pull her into darkness. She admitted to me that the dream terrified her but she was so happy that she was able to depend upon the Lord for her protection. She said that she rebuked the spirit in the name of Jesus and it immediately went away. I know that there are some who doubt a story like this actually takes place, but let me assure you that these incidents are somewhat common here amongst the nationals as well as missionaries. Let us not be deceived to think that the devil has somehow gone on vacation and no longer pays any attention to what is happening on the earth. James 4:7 says, “Submit yourselves therefore to God. Resist the devil, and he will flee from you.” This verse still holds true in the year 2012. 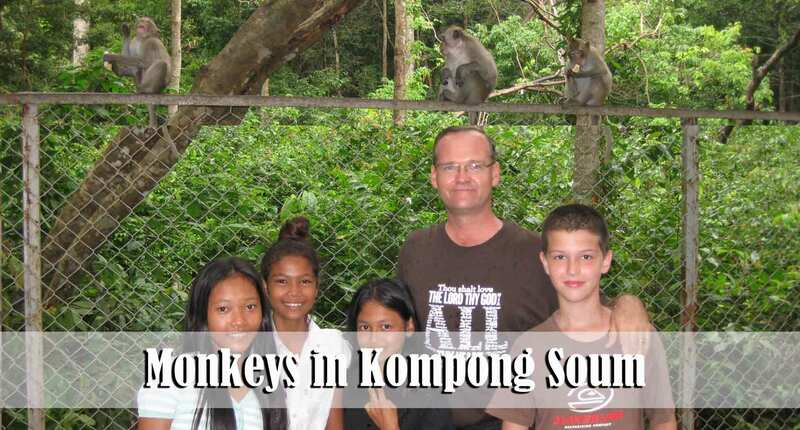 These monkeys were happy that we were Christians – They got the drivers bananas ! Mr. Pheap is the father of some of our faithful members. He went on the trip to Kompong Soum with us. He allows around 100 of our folks to gather on his land every Sunday and Thursday evening for church services in the village. He is still not saved but seems to have a soft heart. 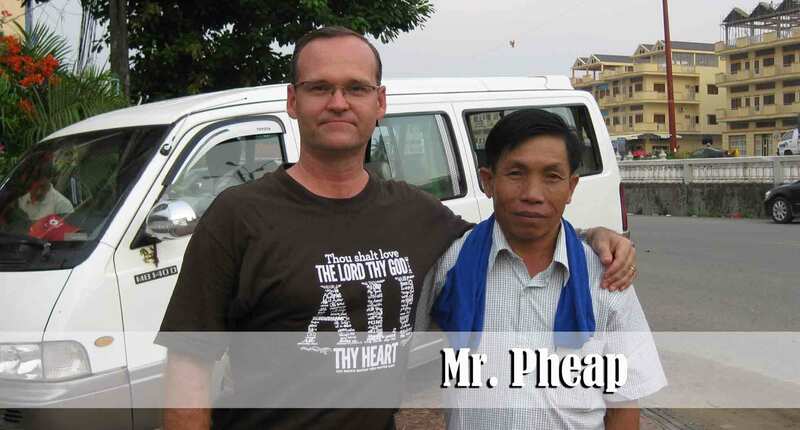 Pray that Mr. Pheap will be saved very soon. Yesterday we put some deposit money down on this building. Lord willing we will begin leasing it on April 13th. Our present location has become too crowded and we are thankful that God has opened the door to obtain this property. 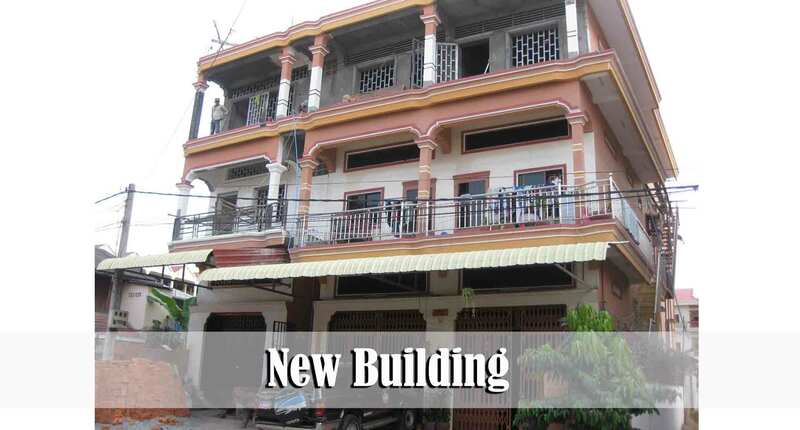 We believe that we will be able to see many more ministries started in this new building which will result in many more folks coming to know the Lord. Thank you for helping to pray about this situation.